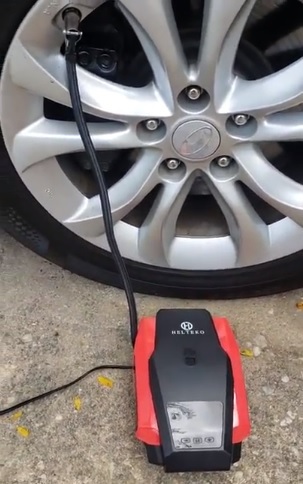 Having a good portable air compressor that can quickly air up car tires can some in very handy in many scenarios. From airing up a flat spare tire, to helping someone that is broken down, portable air compressors are nice to have. There are many good units available with our favorite option below. Audew makes this nice portable unit that works the same as a cordless drill. It has a 12 Volt rechargeable battery or can hook up and run from a cigarette lighter. It has a digital display and can output up-to 150 PSI. The Audew cordless air pump is good unit which I have used many times to air up not only tires but sport balls, air mattresses, and more. This is a most portable option since it has a reachable battery. Also there is no need to plug into a cars cigarette lighter which is good for vehicle that do not put out enough amps to run an air pump. 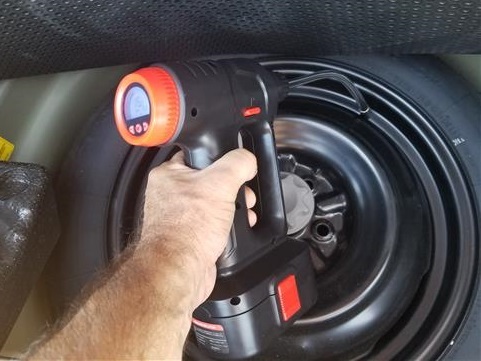 EPAuto makes this popular 12 DC unit that will have no problems inflating a car tire. It comes with multiple fittings and has an emergency flashlight built-in. It also has anautomatic shut off to prevent over inflating a tire along with a nice display. A 9 ft power cable goes to the cigarette lighter for it to operate. The EPAuto 12V DC portable air pump is a good low-cost unit that works well. Helteko makes this nice unit that can pump up to 150 PSI. Most car tires need roughly 35 PSI to be fully charged so 150 PSI is much more than will be needed. It also has a built-in display, auto shut off, and is very compact. The Helteko air compressor is a good unit that will have no problems airing up a vehicles tire. Having a good portable air compressor available is good to have, not only in an emergency but any time air is needed. There are many good units in all shapes and sizes to fit most any scenario. One thing to keep in mind when buying any 12 volt car electrical unit is how many amps it uses and the cars electrical system. All cars are different in how many amps the cigarette lighter can put out. If a pump draws too much power it may blow the fuse which will need to be replaced. While this is rare and most air pumps are built with a cars electrical in mind it is best to check and make sure. Of course portable units with built-in batteries can also be used which does not need the cars power.